From 25th Sep onwards, we had continuous three days holidays. Sitting at home for three days has become almost an impossible task for us now. So, we thought of planning for a long trip. When we checked with my in-laws regarding this trip, they agreed to come with us. Deciding on the place was our immediate next task. The first place that came to our mind was Badami, Aihole and Pattadakal. Along with Badami, we wanted to visit Hampi. But, since there is a lot to see in Hampi, two days of time was not enough. So, we cancelled the plan of visiting Hampi. Along with Badami, we had to decide on one more nearby place which is historic. The name that immediately appeared on our minds was Bijapur. When we read about the places in Badami and Bijapur, Badami-Bijapur trip sounded a great plan. 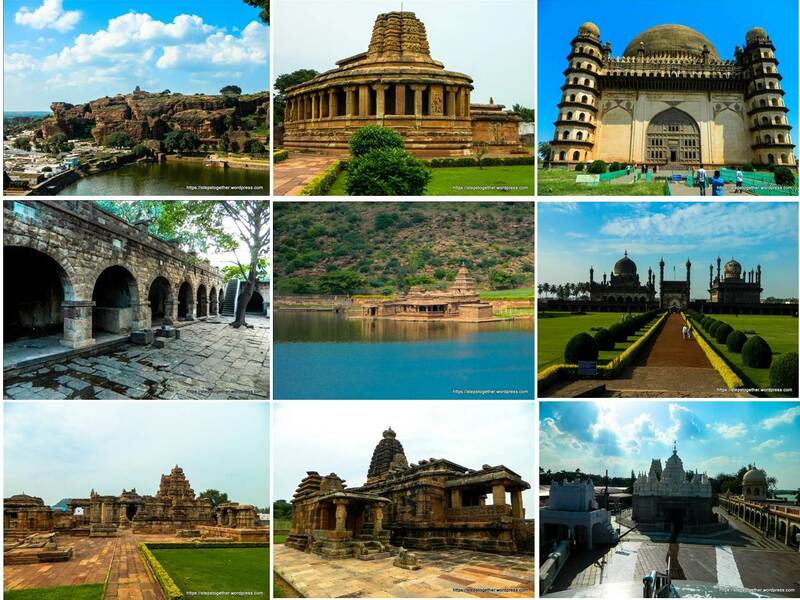 So, we confirmed our trip destinations as Badami, Aihole, Pattadakal (in Bagalkot district of Karnataka), and Bijapur. After referring to many travel blogs, we came up with the below plan. Day 1: Leave early in the morning and reach Badami by afternoon. Finish Badami sight-seeing by evening. Day 2: Finish sightseeing of Aihole and Pattadakal by afternoon. Post lunch, proceed towards Bijapur. In the evening, visit any one place in Bijapur. Day 3: Visit all the popular attractions in Bijapur till lunch and post lunch, start our return journey towards Bangalore. This might look like a very easy plan. But, if you consider the number of attractions these places have, this actually was a jam-packed plan. Not even an hour of rest was included in this plan. The places had so much to see for three days. The plan was as if in one place if we get delayed, entire plan would collapse. Still, we were very eager to see us execute this. We had to book two hotels (one at Badami and the other one at Bijapur) for our stay. At Badami, the only hotel that most people suggested was Hotel Mayura Chalukya, a KSTDC hotel and we booked the same. At Bijapur, we booked a hotel called Pleasant Stay. Next big thing to decide is the route. There are two popular routes to reach Badami from Bangalore. One is through Bangalore > Tumkur > Davanagere > Hubli-Dharwad > Gadag > Badami and the other one through Bangalore > Chitradurga > Hospet > Kushtagi > Badami. The first route is around 524 km and most of the route is a well maintained highway. The second route is 478 km stretch, but in this route, few stretches (for example, from Chitradurga to Hospet and after Kushtagi), the road is single lane and we were not sure of the road condition. But, since this route is around 60 km lesser than the first route, we opted this route for our onward journey. Depending on the road condition, we decided to determine our return journey route. Thanks for reading.. The detailed day wise travel journals are in the links under “Long Trips” menu.. Please read and share your feedback.. Excellent coverage of architectural gems. Beautiful pics. Its a tight plan but worth it. Amazing place. Great travelogue. Love how simply you’ve detailed the trip. Amazing pics. Shall try out all this and hampi has been on my list for long. Thanks for reading .. Glad that you liked.. you have a great travelogue too.. Thanks for nominating me.. It means a lot.. I will come up with the answers soon..
Nice of you to share the detailed versions as well. It looks like a packed trip though! What a lovely trip! How was teh KSTDC Hotel? Thanks for reading.. KSTDC hotel was not up to the mark.. The block where we stayed looked very old and even the service was very bad.. there was one new block which looked good, but unfortunately we did not get rooms in that block.. Thanks for the compliments. .
You mapped out a perfect plan to visit these places!! Your detailed post is like a guide for those who are planning to visit these places, very helpful one.. Thanks a lot Hema and Suma..